I don’t buy coloring books for my kids and never have. I understand that you might feel like I’m attacking a sacred childhood institution but let me explain my reasoning. Coloring inside the lines of someone else’s drawing is not art and it depresses creativity rather than encourages it. I would much rather have my kids draw and color their own picture than use a coloring book. I’d also rather have them play a drawing game or use a drawing prompt, as those are also creative activities. A child who is making his or her own unique artwork will still get “coloring” practice if that’s important to you. And I assure you that they will likely start to color “inside the lines” with age and development, but there’s no need to encourage it unduly or too early. 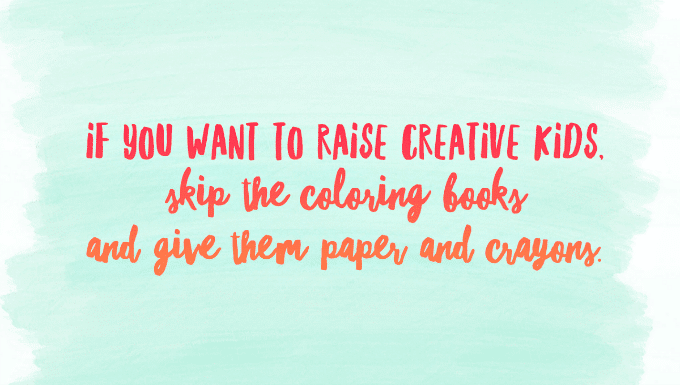 If you want to raise creative kids, skip the coloring books and give them paper and crayons. Encourage them to draw for themselves. A doodle book of drawing prompts. I especially like Taro Gomi’s doodle place mats, partly because they are easy to pull out and use one at a time, but mostly because the drawing prompts are approachable. They are loosely sketched and kid-like without drawing “down” to them (more abstracted than anything, really). My kindergartener easily adds her own drawings without feeling intimidated by the existing drawings. The Anti-Coloring books for older kids. I had one as a tween/teen. That said, I’m not the coloring book police. My kids use (and enjoy) the coloring sheets that restaurants give them with their kids’ menus. (Although just as often, they’ll flip them over to the blank side and ask to play the scribble drawing game, tic-tac-toe, or do back-and-forth drawings.) And they’ve received coloring books as birthday gifts (A few pages might get colored in before the book is forgotten). I don’t make a big deal out of it. But I also don’t buy coloring books for them. I’d rather have them draw their own art than color in someone else’s. This girl has definitely got her own drawing style going on here! These are just a few of the many color field and pattern artworks that 6yo Daphne has created lately while we read bedtime chapter books. If your children want a simple coloring experience, how about doing a scribble drawing then coloring in the shapes? Or make color field drawings as Daphne’s been doing for months now as her storytime drawing. I’m a first grade teacher. For creativity, I agree that encouraging kids to create their own art is superior. I guess I don’t see coloring pages as competing with the goal of creativity, though. Most kids love to color – there’s something calming about it. In my classroom, it’s an activity kids can choose at certain times. Many of my kids choose to color when I’m reading aloud a chapter book. It’s a mindless activity that doesn’t compete with listening, and for some kids, having something to do with their hands enhances their ability to listen. Agreed :) I love open creativity. But I color for calm. There is a place for both. to create whatever comes to mind but we also have time for colouring pages and these serve a completely different purpose. I actually sell my own which are based around stories and nursery rhymes and we spend time colouring these in together and talking about the characters on the page. They make for a great shared activity at the end of the day or simply when we need some down time. I also find that doing this together opens up my kids to chatting about their day or any other topic they want to discuss without the usual mum interrogation anout how their day was and what they got up to. I still carry lots of blank paper and pencils with me however when we go out and about and they need to be able to entertain themselves. Interesting blog post! We have received coloring books as gifts and I have bought coloring books for our kids when they were little but I have found that they prefer blank paper and a pencil or pen. Most coloring books in our house go unused. I used to be firmly anti-coloring books for my children for all the reasons you mentioned. It even made me a bit twitchy when they were given coloring sheets at church or restaurants or library storytime. I never instructed or directed them, and I usually made them disappear soon after. Then, I don’t know, I just chilled out. We’re an art passionate family. My children’s creativity and love of art astounds and tickles me. They spend the majority of their free time engaged in creative activity. But I like coloring in coloring books. I find it a soothing way to turn off my brain. My 6 year old daughter asked for some mandala and zentangle coloring books of her own, and my 4 year old son soon followed suit (though his request was for Peter Rabbit and Jurassic World books). So they have some and will use them from time to time. It hasn’t appeared to stifle them. They don’t seem stressed about coloring in the lines. It turned out to really be a non-issue for our family, likely because they already had that open, creative foundation. Even so, good food for thought! My 10 year old has received coloring books as gifts. I used to be more against them but there does seem to be something meditative about them for her and often she adds her own drawings and imbellishments. I like the idea of offering lots of different creative outlets and allowing her to have independnce to choose, Especially at this age and try to hold some of my personal opinions for when I need them to really matter. Interesting discussion. I normally enjoy this blog, but I really don’t see the point in making a “for or against” issue out of coloring books. There is already way too much of that kind of negative energy in the parenting world. Before I had my kid, I was completely with you. Until he was three it was all about blank work spaces and fun materials (many of which were discovered or inspired by this blog). Come to fid out my kid has a sensory processing disorder – the way he is wired makes it a challenge to use writinh utensils and makes it impossible to intuitively draw. At four years old can now – almost – draw a plus sign. So it turns out I am now a big fan of coloring in a book with him hand-over-hand and helping him carefully trace lines. Motor control and organization precede creativity. So it turns out coring books have its place. However, I look forward to the day I can hand him a blank page or prompt and witness his creativity and personality form on the page. HOW TRUE AND SPECIAL, YOU ARE , LANDS SAKES EVERYTHING THESE DAYS IS ANTI THIS AND THAT, GIVE KIDZS BOTH LET THEM CHOOSE. COLORING BOOKS OR PAGES. TODAY ITS NO CANDY NO SUGAR NO FUN OUR CLANS AND GENERATIONS EVERYONE HAD SWEETS DESSERTS ETC PLAYED OUTSIDE UNTIL DRAGGED IN AFTER DARK AND HIDE AND SEEK. NO CELL PHONES VIDEO GAMES OR COMPUTERS. AND EVERY ONE TURN OUT GREAT, HIGHLY INTELLECTUAL INTELLIGENT, WELL ADJUSTED HEALTHY, NEVER ANY CAVITIES , BUT THEN AGAIN WE WERE RAISED ON GARDENS, LARGE AND SMALL, DAIRIES, AND ALL KINDS OF MEAT PRODUCTS ALL NATURAL PRODUCTS, NEVER HAD ALL THESE PROCESSED FOODS, VITAMINS, DIDNT GET IN TROUBLE AS TODAY, TOO BUSY WITH SCHOOLS, CHORES, PLAYING AND LEARNING TRUTH AND RESPECT. TO DAYS WORLD IS SICKNESS, SAD, AND STRESS, HOW UNFORTUNATE. We have them on hand (an enormous stockpile actually), but generally my kids prefer to draw their own pictures. My 7 year old does love the activity kind of colouring books that include puzzles and mazes etc though. I just don’t see it as something that discourage creativity. It’s just something on its own. It’s just something some kids love to do. Just fill in with colours. And it’s a practice for fine motoric skills. There are a lot of crafting things that aren’t creative either. Like the ironing beads. Kids love to make the same as the example, would you say they may not? Children love it to make something with their hands. And for adults, is cross stitching something creative or is it just reproducing? I’m a mother of two very creative kids… now adults and a preschool teacher. You wrote the comment I was going to write. I bought my 28 year old actress/artist daughter the Harry Potter coloring book for Christmas and she loved it. Why does everything have to be either/or? I was against coloring books, but then I realized that my reluctant artist enjoyed them and it was a good way for him to refine his fine motor skills that felt safe to him. My 5yo daughter has some of the new zen coloring books that she enjoys. She is a very emotional child and for her, they fill a need for quiet time to get centered and practice focus. I don’t look at the time my kids spend using these as time doing art, but they do fill different needs for them. There are other activities that I’d put in a similar bucket — connect the dots and word searches are two off the top of my head. They are so prescribed and while they may have their place for helping to learn a specific skill, unless a child is really struggling there are richer activities available that also develop those skills while leaving room for more creativity and imagination. I think they both have their place. I think that drawing is a great brain activity that strengthens decision making, spacial abilities, and hand-eye coordination while giving kids a chance to express themselves. Coloring can be great for calming the brain and relaxing without the stress that some people might feel about drawing. If people or kids enjoy coloring, then they should do that without guilt. If people want to encourage their kids to draw, I’ve come up with lots of resources that help children make individualized drawings through drawing choices. They reduce some of the stress of drawing because they give children a place to start while also encouraging them to make decisions and try out more that one way to drawing something. You can see more on my website: http://www.expressivemonkey.com I hope you will consider taking a look and adding my site to your wonderful resources. Many people don’t feel confident in their own drawing abilities and don’t know where to start when encouraging their children to draw. I hope that my resources will help parents and teachers give their childrem more drawing experiences. I agree entirely… I am not a fan of colouring for little kids, there are so many better options that don’t stifle my kid’s creativity. As my kids have gotten older they have really embraced the adult colouring craze as a way of ‘zoning out’ and relaxing, which has been so awesome for my anxious child, and I think that’s fine too. I think older kids use and see colouring activities in a different way than preschoolers. Just like older kids love following the pre-written steps to make a craft, whereas little kids are more about experimentation and experiencing the process so we give them open ended process art activities – I think there is a difference in the way kids use these activities according to their age and I think it’s valuable to be aware of that. THANKS for your great blog, Jean! I too hated coloring books as a kid. I wanted to draw my OWN lines! LOL! I TOTALLY AGREE!!! I could have seriously written this myself! And MAN do people get ready to fight when you come out against coloring books/coloring pages, huh? I’ve dealt with this for years…way back to when I learned all you said above in my child development classes in college (got my bachelor’s in child development.) They really pushed the NO coloring books/pages in my child development classes. I listened and took it to heart and my kids have not been raised with them and are amazingly creative. Not saying you are NOT creative if you use coloring books…but I do think they are not a positive thing. But I, like you, also didn’t make a huge deal of them either, at restaurants or when received as gifts. It’s such a relief to read someone else with the same perspective. Thank you for writing this!!! I think every parents helps their kids for growing more and more do motivate them and try to make them more better in what they interested. I agree with you…As an art teacher, I am naturally against coloring books for small children, and I did not buy them for my girls. I have never made a big deal about it…when they have been given to us as gifts, they just don’t get used because my kids find them boring & choose to zone out when needed by doodling or drawing. as for their own blank paper. Everything in moderation I think. Coloring books, granted, are other people’s work. But they can inspire and spur creativity. My kids eat apples that other people grew, perhaps i should make them go out and become their own farmers? I get your point, but i hope you can see the benefits of books as well. TL;DR version: There are a lot of reasons to recommend coloring books as one option among many from which children can choose. Especially when children come with trauma histories. As a fourteen year old I was raised with the choice to use colouring books or draw myself, and did both. I also used a variety of finish the drawing books and scribble drawings, where I scribbled on the page and coloured in the spaces. Now I am hoping to go into a career in art in the future and have selected art as one of my main GCSEs, and I still use colouring books. I found as a child and still do now that drawing can be extremely stressful, especially if you just can’t get it looking how you want it to. At times like these I like to turn to colouring books, so I can focus on the colouring rather than the lineart. Lineart and colouring are two completely different things that you need to practise in equal measures to get good at drawing. Of course I down expect children to be shading and applying shadows, but whilst lineart practise is a very good skill to learn, colouring is equal importance but usually gets lost as the lineart is seen as more important. This is why colouring books can be useful; they allow you to focus completely on the colouring, with a ‘perfect’ lineart already there for you. I think that as long as you provide children with both colouring books and paper and pencils, they will choose to do a mixture of both and develop both the skills of freehand drawing and colouring in. Great article! We don’t do coloring books at home too. With my 5 year old, we use art prompts or when I’m drawing, she would also join in. I’d let her know what my theme was and she would decide whether to follow my theme or not. We usually end up with the same theme but a different interpretation of it. With my 3 year old, he loves cars and so I’d draw parts of it and he would try to finish up for me. but for now, he just loves cutting and so I’d give him old car magazines to cut. It’s just different age and different times that they prefer certain activities over others. I am a big fan of your blog but this is the first time one of your posts has really disappointed me. I started drawing as soon as I could grip a crayon and never stopped. It is a habit and passion that has carried through my life. I am a creative, talented artist and I LOVED colouring books when I was a child. I loved that satisfaction of making colour choices, practicing shading and creating something that looked so complete. I learned a lot about outlines, line art and following the shape and line work of more practiced artists than I was at that age. There is so much for artists to learn from the work of other artists. Of course I always had the option to draw freely and avidly did. It’s art, it should never be either-or. Especially for self conscious children who wish to be creative but are anxious of creating their own drawings. Saying that colouring books are not art and depresses creativity is sadly narrow and pretentious for this generally encouraging blog. I find this interesting but there are some kids who need to be raised with some coloring activities in order to have some basic aspect of drawing . I use these for my kids and my friends as well. your method is actually recommended but i encounter some challenges with some kids while drilling them through this method but i believe that with time the always get it. I had not thought about this before. I know early on between 2 and 3 years of age, my daughter would get so upset and frustrated when she would color outside the lines. Sometimes even a tantrum would occur. She wanted me to color with her/for her. So I started coloring outside the lines to show her it was okay. Didn’t really work. After reading your article, I can now understand more of what caused her frustration. I am so glad I’ve gone more towards open art for her. I loved to color as a child and I was and i am the most creative peer. Just saying. Its a good theory but not true. Colouring cant repress creativity. It inspres. I should add that I won many 1st prizes over the years for my art. Colouring in books do not stifle creativity – they are a fun-filled activity that even adults can enjoy. My very artistic mother at 79 loves the adult ones. As for young children, let’s try not to overthink things and let them be children. My husband actually makes colouring books for our toddler daughter (he’s a beautiful artist) and she watches him create the characters from books and TV come alive on paper and then enjoys filling the pages with her gorgeous array of colourful strokes. At the same time, given a blank sheet and crayons, and even her magna-doodle, she enjoys coming up with her own creative “masterpieces” just like all children do! When all is said and done, I think there are bigger issues with raising children today than worrying ourselves about the merits of colouring books. If you want creative children, get rid of the iPads, iPhones and computer screens and too much television. They are creativity’s arch nemesis – not joyful colouring books!